Browse: Home / 2019 / March / 17 / “Global Warming” Leaves Ireland In The Cold …Emerald Island Has Been Cooling Over Past 3 Decades! As today is St. Patricks Day, it’s a good time to look at Ireland’s annual mean temperatures over the recent decades. As we recall, global cooling was the scare of the 1970s before global warming became the scare in the 1980s. So since the 1980s, a fair amount of warming must have taken place, right? Obviously global warming never made it to the island. 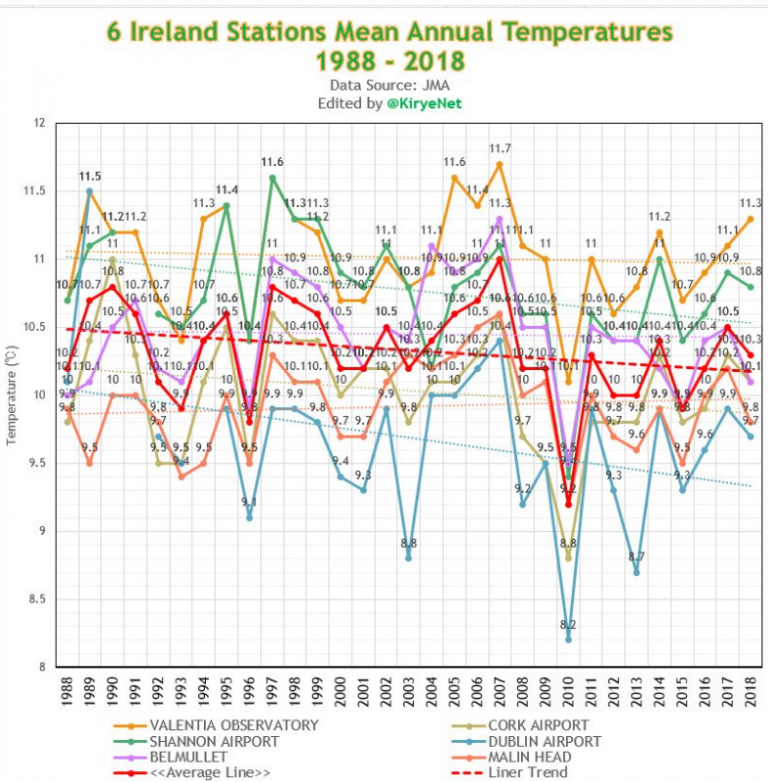 And yes, it’s mysterious how the Irish media still continue to hysterically warn about warming when temperatures in fact have been falling instead of rising. The source of the (untampered) plotted data is the Japan Meteorology Agency (JMA). The six datasets were selected because of their data completeness – only a few months of data are missing. There has not been any warming since 1986, thus surpassing the 30-year mean that is defined as “climate”. We see a similar trend in my home country of Japan. When did the Irish cooldown start? After the cold years of 1986 and 1987, the temperature spiked more than 3°C in a single year to 11.5°C in 1988, the year that Dr. James Hansen told the world before Congress that the planet was heating and would heat up to unbearable conditions within 30 years. If the Irish can celebrate anything this St. Patrick’s Day, it is the fact that they won’t need to worry about overheating anytime soon. Pierre Gosselin contributed to this article. There is a reference to serious global warming there, but its a mixed bag. Clearly we have nothing to worry about, what significant climate change which occurred over that 200+ year period occurred in the early 1800s and life went on then as normal. 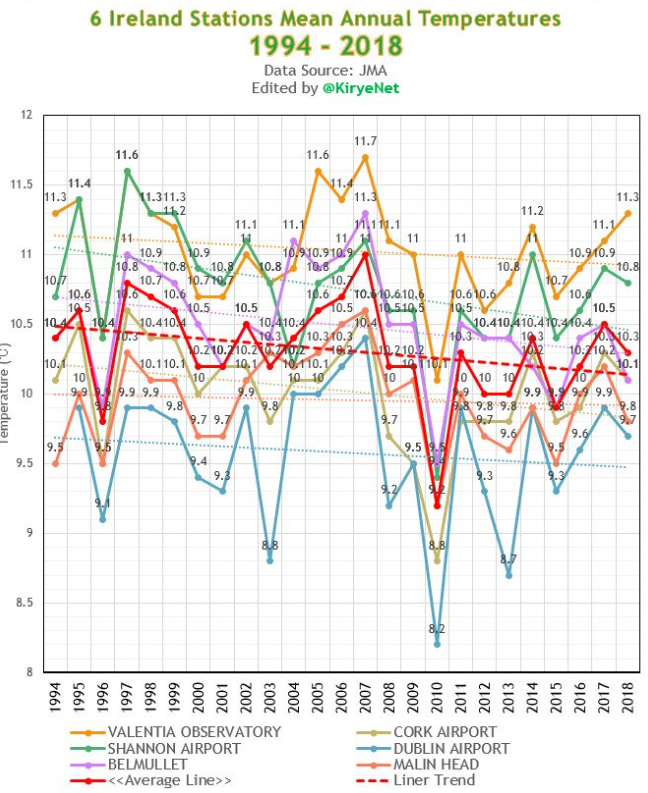 Also interesting to see the clear undulation in the record corresponding to the Atlantic Multidecadal Oscillation, which the researchers in our own weather service (Met Eireann) tells us is responsible for more than 90% of the decadal variations in temperature and precipitation. I’ve personally seen more that 50 years of varied weather, but if there is any change in climate, it is absolutely minuscule, and in this regard I didn’t see a decent snowfall in Dublin until I was 16, while in the last 10 years there has been quite a number of winter snowfall events in Dublin. “It is clear that a widespread consensus formed in Ireland around trends, assessments and policies that participants should have realised to be unsustainable or unsound. This section briefly presents two concepts (“Herding” and “Groupthink”) that may help understand why and how so many institutions in Ireland simultaneously made imprudent decisions”. “Groupthink occurs when people adapt to the beliefs and views of others without real intellectual conviction. A consensus forms without serious consideration of consequences or alternatives, often under overt or imaginary social pressure. Recent studies indicate that tendencies to groupthink may be both stronger and more common than previously thought”. As far as the remark banking crisis and climate alarmism, it applies right accross the entire transatlantic – from Northern Wreck, Barclays, AIB, to Lehmann, AIG and now Deutsche Bank after all the LAndesbanken were bailed out. The repeal of the 1934 Banking Act, Glass-Steagall, in 1999 in transatlantic lockstep is the reason for the the chaos. Even Nyberg was in favor for banking seperation. See the London Economist campaign for the repeal and WallStreet’s Greenspan. To dump the bailout then on hapless citizens takes committed politicans like Bush, Obama to then say its groupthink – its their own fault! What a precedent for Greta to say the end of the world in 12 years is people’s own CO2 fault! Notice the choice or words – it’s from the same horse’s mouth. Notice Davos inviting Greta – these are the bailout gangsters. Trump is having fun reminding Macron of the Paris accord, and campaigned on Glass-Steagall. Sure, he is getting unmitigated flak for that. When the next banking cris hits – (corporate debt) he will have no choice to apply Glass-Steagall – his base would never accept another Obama bailout. London is hysterical at the prospect! Click on the “Climate Change …” link on that website and find some graphs. Downloadable data is available as well. So one of the central points of this blog post (“Obviously global warming never made it to the island.”) is a lie. The other one (“There has not been any warming since 1986”) is a lie as well. Or maybe that’s to harsh a word for this … it is a deception based on presenting cherry picked data. Better? IF they have lied before, they’ll lie again. I don’t trust them anymore than I would some random troll. Show us the UNADJUSTED data, SebH – not the propaganda. To refer to Johnathan Swift again, the author of Guilliver’s Travels: “There is nothing so useless than to attempt to reason a man out of something he did not reason himself into”. While there is currently unfortunate climate hysteria and associated intolerance in Germany, it is still a ‘bit rich’ to be lectured on the Irish situation, by somebody who clearly does not understand our history, politics, economy and weather. Furthermore, Ireland is a complex place requiring one to read between the lines, which is not a recognised Teutonic skill. When Ireland joined the then EEC in 1973, it may well have been on the Western side of the Iron curtain, but its economy and the level of State control exceeded many of those countries on the Eastern side. This had unfortunate consequences, namely the place was an economic basket case. The level of centralised State control, with decision-making concentrated into the hands of a few alpha personality Ministers is still frightening. There is no effective justice system to challenge the State, while the decision making ability of local and regional administrations is effectively zero. It is also fair to say that a major reason why so many in the Republic of Ireland are so pro-EU, is that they see it as necessary to put manners on their own Administration (the reality of this being for another day). Official Ireland is now in ‘grooming mode’. We already have punitive taxation (the highest in Europe) and no effective influence on our administration (economic units not citizens), but clearly the administration is enamoured with: (i) The potential to raise more State income through carbon taxation and; (ii) the ability to move energy systems out of the free market and back into State controlled and State run organisations. 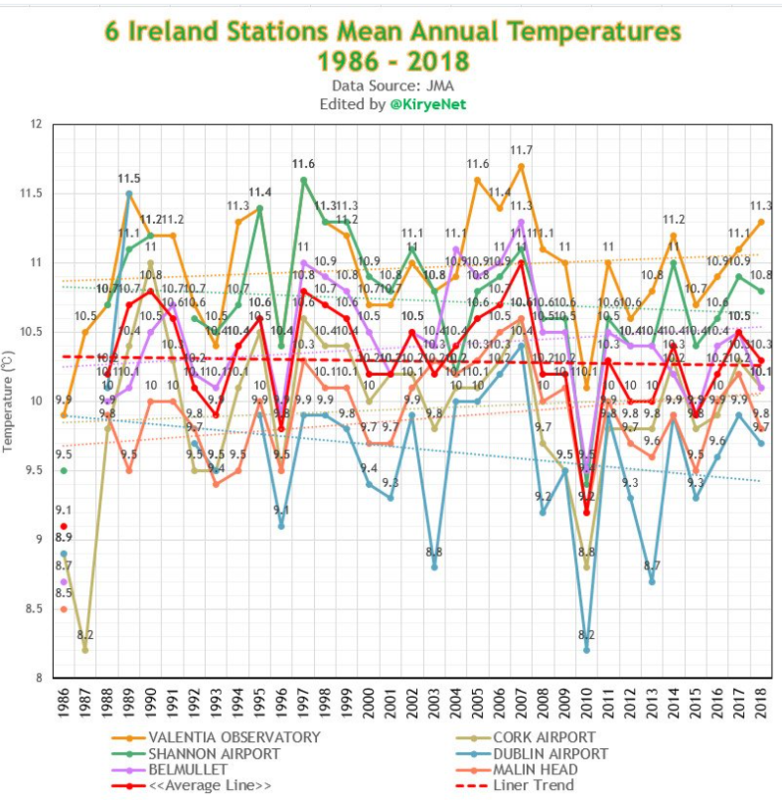 The biggest influence on Irish weather is the Atlantic Multidecadal Oscillation (AMO), where there is an approx 30 year warm period in the Atlantic followed by an approx 30 year cold period. During the warm phase our winters are milder and wetter, while so too our our summers. Colder phases are characterised by more high pressures, leading to cold snaps in winter and warmer summer periods (summers of 1974 and 1976 were wonderful). Given that a significant number of our temperature measuring sites are in urban areas, we would expected this to drive up the mean temperature as shown in the graphic in your link. After all the population in the Republic was 6.5 million mostly rural farmers in 1841, then crashed to about 3 million due to famine and mass emigration by the time of independence in 1921. It was just under 3 million in 1971 as the economy was still a mess and many were still in rural areas, by 1991 was only 3.5 million even though in the 1980s half the population was under 25, as a lot of these subsequently emigrated due to the economic mess at that time. Then the economy took off and we reached 4.6 million by 2011 and we are now over 4.8 million with a huge urban increase and a significant rural decrease. Despite this ubanisation and heat island effect, the recent trend in the 2100s in the Irish temperature record is one of a degree of cooling and while there are signs of the AMO going negative again, it has not happened yet. the road ahead”. As it says and one doesn’t have to read much: “The observed warming over the period 1981-2010 is expected to continue with an increase of ~1.5 degrees in mean temperatures by mid-century; the strongest signals are in winter and summer”. The years of the 2100s are actually showing a decrease, while summer temperatures have not increased since temperatures were measured in Armagh in the 1790s and in fact even with urban heat, we have not beaten the highest recorded summer temperature set in 1887. Irish people have nothing to fear from what are quite minuscule and natural fluctuations in the weather, not least as the weather is always constantly variable here. However, they do need to fear as usual the destructive nature of their own State administration, which yet again is clearly ‘on the make’. Thanks for a very considerate, educational and knowledgeable post. It supports the original post with facts and depth and should humble and silence those Teutonic critics of which you speak. The big movement in Ireland now is to decarbonise. Its all that the lefty talking heads can talk about. But NONE of them can explain what affect it will have on global warming scenarios. It is rife and no one is shouting stop. I know people can be stupid but didn’t realise how stupid they can be or how easily influenced until I began following the Irish high priests on climate action on Twitter. The same few names are whipping people in to a frenzy 247. Here’s an article from just 7 years ago. Now consider the trolls here who “parrot” the warming narratives, never supporting their assertions with anything more than a link to other parrots, always telling us “it’s science,” when they wouldn’t know what science was if it bit them on their nose.